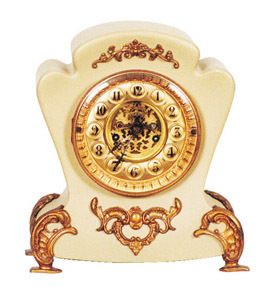 Waterbury Clock Co., enameled iron case "Whitlow", ca 1893. The nice label calls this the "Wine" color. It also was made in pearl and royal blue. Gilt ornaments all around, fine gilt dial, fancy gilt center with open escapement, beveled glass. 8 day, strikes half hour on a gong. Rack and snail count, clock running. Case is 11 inches high, 10 inches wide. It is much too nice, surely restored at some time, near perfect. Ly-Waterbury No.1033.